Hi there! 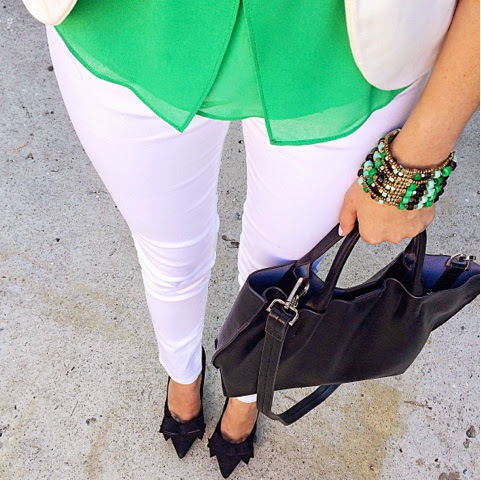 Today's post is all about my favorite color, green! I found this cute little emerald green top at Tjmaxx a few months ago and thought it would look perfect with my bracelet from Urbiana. I have a really hard time finding bracelets that fit my tiny wrist, that's why you always see me with a watch on. I was so excited when I received this stretchy bracelet in the mail, not only does it fit but the array of colors it has allows me to wear it in so many different ways! I have one more jewelry piece from Urbiana that I'll be pairing in an outfit soon, stay tuned! In the meantime, make sure to visit the site and check out all the neat jewelry items they carry, you won't be disappointed!